Madison Arm Resort & Marina is located in the Gallatin National Forest on beautiful Hebgen Lake. 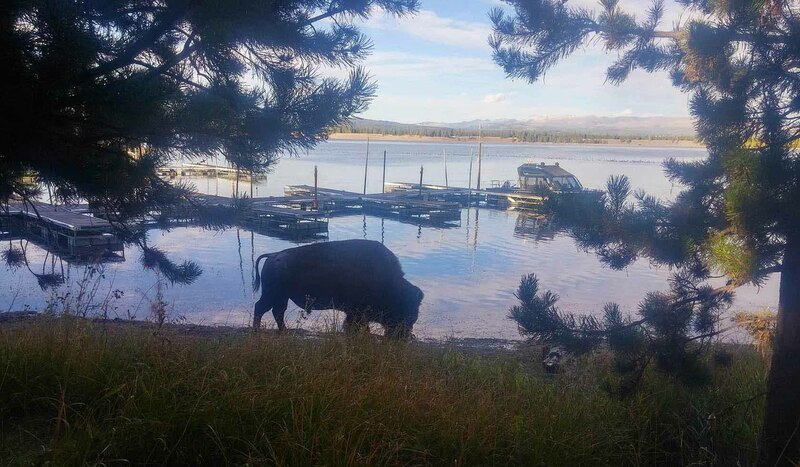 Our RV park has 52 full hook-ups, 22 tent sites, as well as cabin and cottage rentals. We also have complete marina facilities with boat launching, docking facilities, fuel and boat rentals, a well-stocked general store, snack items, dairy items, soft drinks, candy, fishing licenses, tackle and bait, and a laundromat. Our well-appointed efficiency cabins and cottages come complete with bedding, towels, and all kitchen utensils. Our cabins feature three double beds, one in the master bedroom, and two in the loft. From the cabin window there is a splendid view of Hebgen Lake, with the mountains in Yellowstone Park in the background. It is a great place to return after a day fishing or sightseeing. Our modern cottages sleep six with one full-size bed and four built-in bunks. A full-size kitchen, pleasant living and dining room, and tub/shower in the bathroom makes these cottages a great place for family vacations. We are open May 15 through October 1.